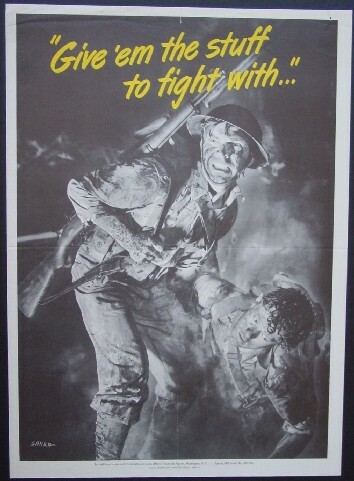 Comments: This poster features two American soldiers in the midst of battle and having a hard time of it, which is the appropriate time to make a pleas to "Give 'em the stuff to fight with." The poster was published by the Graphics Division, Office of Facts and Figures which, unlike most government organizations, apparently did not last in perpetuity. Condition: Excellent, unbacked with the usual government folds, as issued.